Posted August 6th, 2018 at 9:20 AM (CST) by Bill Holter & filed under Jim's Mailbox. This is a must read, Browder is what Russia gate is all about and the deep state needs to cover its tracks. Joe Nocera aid Browder and his new-mafia partners. Browder is bolstered and empowered by crooks and nincompoops alike. As for Browder and his getting the U.S. Congress to pass the Magnitsky Act, he probably blackmailed the American government with information tying the so-called Money Plane and the U.S. attempt to set up a puppet government in post-Soviet Russia. The Americans did not eliminate Browder because he could be a useful chess piece against Putin’s Russia. And here we are. Bloomberg writer Joe Nocera says Russian kleptocrat Bill Browder is the “man Putin can’t get out of his head.” But Browder is the man Bloomberg and the west won’t let any of us forget. Here’s why. Bill Browder’s claim to fame is that he, the American-born Jewish tycoon who worked to destroy Russia during the Yeltsin era, is Putin’s enemy number one. The banking villain who created the investment fund Hermitage Capital Management for the purpose of stealing trillions of dollars in Russian assets. Let’s just call big investment banking what it really is here. Browder’s intention of using Hermitage to soak up the wealth of Russia when the country was at its weakest is a matter of history. The grandson of the US Communist leader arrived in Russia after the Soviet collapse and grabbed an enormous fortune using opaque financial transactions. Browder would have been okay in his position as transplant oligarch, except for two big mistakes. First and foremost, he got way too big for his britches and ran afoul of Russian President Vladimir Putin, who had been lenient with opportunists from the Yeltsin era. Secondly, the American chiseler in Moscow got too greedy and hired a shyster accountant named Sergei Magnitsky to evade Russian taxes altogether. This facet shows who Browder really is more than any other aspect of his dealings because Russian taxes on oligarchs are virtually nothing anyway. A business leader has to be the ultimate miser to try and chisel the state out of relatively paltry sums. Browder is a miserly psycho, which is further indicated in his relentless pursuit to develop Putin haters. If President Trump does this, we will know for sure the deep state does not own him! Courtesy of GG. Look for President Trump to declassify the June 2017 Carter Page FISA renewal this month, says investigative reporter, Paul Sperry. 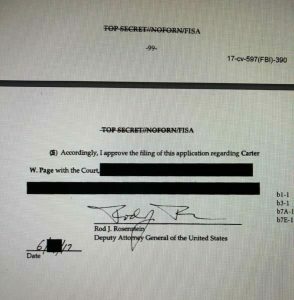 Deputy Attorney General Rod Rosenstein and then-Deputy Director of the FBI Andrew McCabe both signed off on the June 2017 Carter Page FISA renewal–things could get interesting! Thanks to Judicial Watch, the Carter Page FISA docs were released a couple weeks ago after the watchdog filed a FOIA lawsuit. Although the documents were dishonestly and heavily redacted, they confirm the FBI and DOJ misled the FISA courts. GOP lawmakers such as Freedom Caucus Chairman Mark Meadows (R-NC) and Rep. Lee Zeldin (R-NY) called for the FISA docs to be declassified. I think it is a good idea to listen VERY carefully to GG on this one, he speaks the truth! It is all fake, we are all being fooled by the monetary authorities. If the central banks wouldn’t buy the paper issued by the treasuries there wouldn’t be enough demand for the bonds, which would propel interest rates much, much higher and basically all your debt paper would be without value. Just think! They keep the chair dance going ‘til people start selling back to the government as we are witnessing in japan. I think we are in the last innings! And if the central banks come with rescue measures, read more qe, the currencies will go through the floor in terms of purchasing power. The only way to safeguard yourself is buying physical gold and silver. 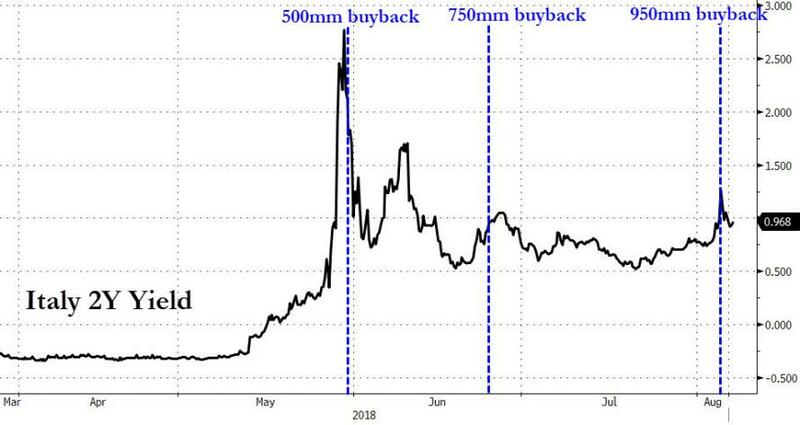 Italian bond prices rose on Monday after the Italian Treasury announced on Friday that it had intervened in the market with yet another debt buyback operation following a steep price decline on Friday. Unwilling to wait for the ECB’s generosity, late last week the Italian government bought back nearly €1bn of its own short-dated debt late last week amid concerns of another breakdown in relations with Brussels after the country’s populist coalition launched negotiations over its debut budget, prompting a sell-off. It was the treasury’s third – and largest to date – intervention in the bond markets since the coalition took power in late May, an event which stunned investors resulting in a record plunge in Italian bond markets and a slide in Italian risk assets. Today, the United States is taking action to reimpose nuclear-related sanctions with respect to Iran that were lifted in connection with the Joint Comprehensive Plan of Action of July 14, 2015 (the “JCPOA”). These actions include reimposing sanctions on Iran’s automotive sector and on its trade in gold and precious metals, as well as sanctions related to the Iranian rial. These measures will take effect on August 7, 2018. All remaining United States nuclear-related sanctions will resume effective November 5, 2018. These include sanctions targeting Iran’s energy sector, including petroleum-related transactions, as well as transactions by foreign financial institutions with the Central Bank of Iran. The United States is fully committed to enforcing all of our sanctions, and we will work closely with nations conducting business with Iran to ensure complete compliance. Individuals or entities that fail to wind down activities with Iran risk severe consequences. I am pleased that many international firms have already announced their intent to leave the Iranian market, and several countries have indicated that they will reduce or end imports of Iranian crude oil. We urge all nations to take such steps to make clear that the Iranian regime faces a choice: either change its threatening, destabilizing behavior and reintegrate with the global economy, or continue down a path of economic isolation. This an amazing interview about Browder, the Deep State and the indictments that will happen – Must listen interview very interesting.